As the sun broke through reptiles emerged to warm up beside the south west coast path. We passed two boldly marked male adders, Vipera berusand, and one Common Lizard, Zootoca vivipara, out in the open soaking up the sun. I still find it surprising that it’s so easy to walk past such dramatically marked snakes without noticing them. 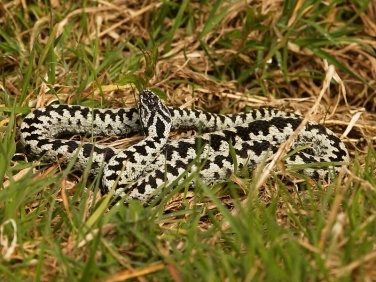 Adders, also known as Vipers, are surprisingly common in parts of south west Cornwall. In fact, we see far more adders than Grass Snakes. 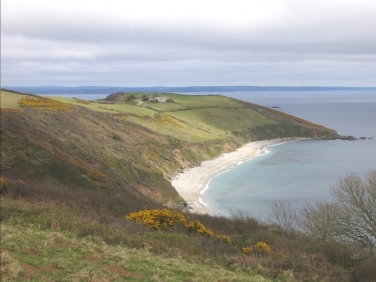 The south west coast path between Gorran Haven and Dodman Point is a well trod path over looking Vault Beach and taking in some stunning coastal scenery. I suspect walkers would be amazed and somewhat alarmed to learn how many adders, some within touching distance, they had actually walked past. Fortunately, if keeping to the path walkers are at little risk of being bitten. However, it is not that uncommon for dogs to receive a bite when straying off coastal or heathland paths here in the south west .